The launch of the DUNF was a significant event in the political history of post-independence Sri Lanka. It created a new opening in social democratic politics of the country. With a refreshingly new manifesto prepared by a committee which included Amunugama, the new party started an aggressive political education campaign based on public meetings which drew record crowds.The DUNF leaders toured the length and breadth of the country much to the ire of the President. This successful campaign also invigorated the SLFP and the Left which had been enfeebled by bitter internal wrangling. The political momentum was definitely with the DUNF. The new President pinned his faith on a split in the new parties leadership since Dissanayake and Athulathmudali were indeed rivals. There were personal ambitions involved but Amunugama was able to successfully negotiate an equitable solution which was, perhaps grudgingly, accepted by both sides. No sooner was this compromise announced to the media, the President dissolved Provincial Councils and called for elections, obviously with the hope of stopping the new party in its tracks. The DUNF, now called upon to hastily prepare for elections, decided to field Amunugama to help in the campaign for Central Province since Dissanayake would be called upon to campaign countrywide. However the DUNF received a bitter blow when in a few days into the electoral battle, its leader Lalith Athulathmudali was assassinated. One week later the President himself was assassinated. The country was in turmoil once again. 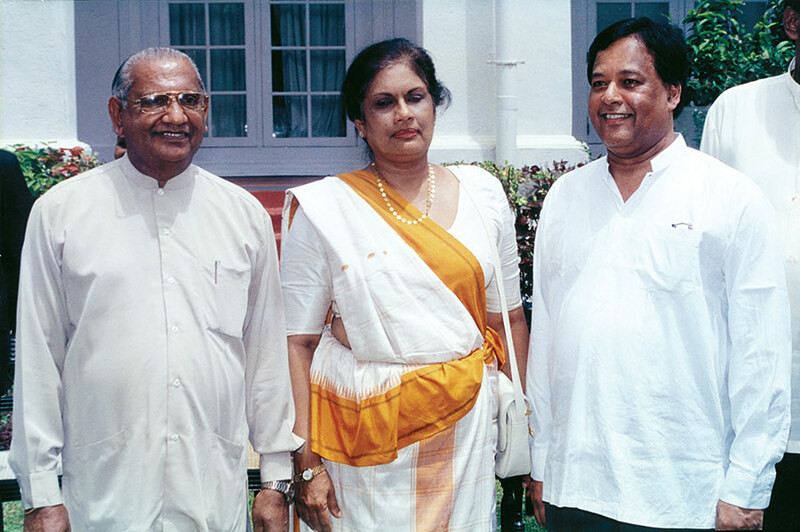 With President Chandrika Bandaranaike Kumaratunga and Prime Minister Ratnasiri Wickramanayake. Though the DUNF fared well at the Provincial Council elections, it did not get sufficient votes to form administrations of their own. Instead the new party was wooed by the SLFP and together they formed a coalition which wrested control of several provincial councils including the Western province from the UNP. But with the demise of President Premadasa and the accession to power of Prime Minister at the time D.B. Wijetunga, Gamini Dissanayake realized that he could mobilize a large following in the UNP and emerge as the senior-most leader if he returned to his old party. However President Wijetunga, and some of the seniors who held office, were initially very hostile to this approach. The only DUNFer who had very cordial relations with the new President was Amunugama who was both a kinsman of and a former Permanent Secretary to President Wijetunga. He therefore undertook the very difficult task of influencing President Wijetunga to change his mind regarding Dissanayake. He succeeded and most of the DUNFers returned to the UNP fold. However memories of the impeachment battle created a major rift in the party which reverberates even to this day. In the general election that followed, Amunugama was invited by President Wijetunga to contest the Galagedera seat from the UNP. This was a seat once held by E. A. Nugawela who went on to be the Minister of Education in an early UNP cabinet. Amunugama was successful and he became a Kandy District MP in 1994. Since then Amunugama has been returned to parliament at every successive election and has a proud record of not only winning every time but also of increasing his vote with every election. 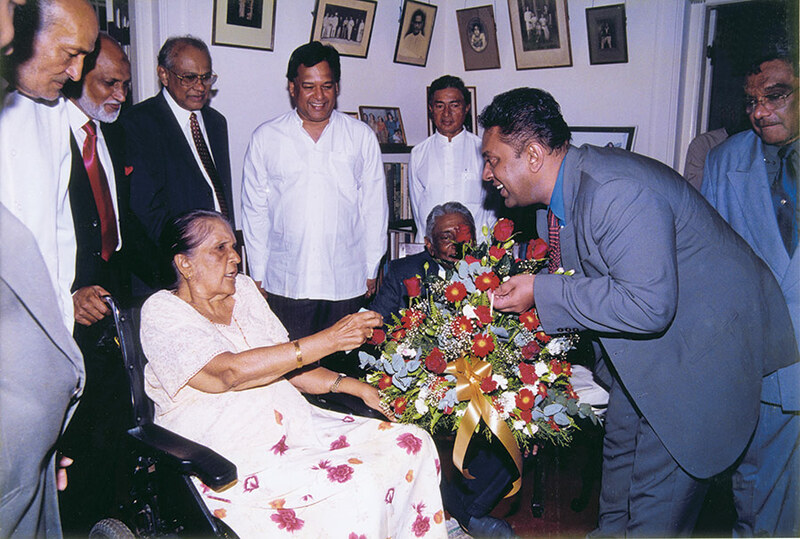 A birthday tribute to Madam Sirimavo Bandaranaike. Even though he won his seat convincingly and was regarded as a valuable Parliamentarian by even the opposition, Amunugama’s close friendship with Gamini Dissanayake irked many of those who had assisted President Premadasa to fight the DUNF. With the assassination of Dissanayake during the Presidential election of 1994 not only did the UNP crash to defeat; the anti-Dissanayake faction of the party began to follow policies which were clearly elitist. A new constitution was put in place. This constitution gave dictatorial powers to the new leader Ranil Wickremesinghe. Amunugama gave leadership to several party seniors who objected to this trend of entrenching the dictatorship of the party leader. On being denied a voice and objecting to the increasing elitist activities of the party leader, five well recognized members of the UNP crossed over to join President Chandrika Bandaranaike Kumaratunga and became a constituent group within the ruling ULF coalition. Those who crossed over with Amunugama were: Wijepala Mendis, Nanda Mathew, Susil Moonesinghe and Chula Bandara. Of the five, Amunugama and Mathew joined the CBK cabinet in 1999. The next ten years sees a period of intensive political activity in Amunugama’s life. For eight years of this period he was a cabinet minister joining thereby an august group that has held long cabinet office. The balance two years were spent by him and Lakshman Kadirgamar, as chief spokesmen of the SLFP during the premiership of Ranil Wickremasinghe. It may be mentioned here that it were these two spokesmen who week after week alerted the country to the problems of the so-called ‘Ceasefire’ of the Prime Minister. They made the village of Manirasakulam well known in the country as a place where the LTTE was using the ceasefire to subvert the security of the state. A special tribute must be paid here to Amunugama’s senior schoolmate Lakshman Kadirgamar, who was the first Sri Lankan politician to fearlessly confront the LTTE. Faced with a rapidly deteriorating security situation President Chandrika Kumaratunga dismissed the Ranil Wickremesinghe government and called for new elections. Amunugama played a leading role in orchestrating the media campaign for the United People’s Freedom Alliance (UPFA). Many observers state that this was a very effective campaign which put the ruling administration on the defensive. Day by day pressure was exerted on the Prime Minister to defend his weak administration. It was also the first time that TV became the dominant mode of political communication. The UPFA’s “Rata Perata” campaign became a benchmark for political media usage. In April 2004 the UPFA won a decisive electoral victory and Amunugama was appointed Finance Minister in the new cabinet. As Finance Minister he, with the concurrence of the President, set out clear goals for the new administration. He expanded social welfare by increasing the fertiliser subsidy and employing 40,000 graduates who had earlier disrupted the Wickremesinghe administration with their demand for employment. However he also laid emphasis on increasing revenue. Revenue collecting departments such as Inland Revenue, Customs and Excise were revamped. By the end of the year revenue had grown to record proportions. He also changed the pattern of aid assistance. New donors such as China, Iran, India and Malaysia were found. Ties with our traditional development partners like Japan and the European Union were strengthened, as were the links with Multilateral donors such as the World Bank and the ADB. Inefficient state enterprises were reformed or sold off. For instance the Bank of Ceylon was encouraged to sell off its shares in the Ceylon Hotels Corporation. Today that enterprise has been turned around. The country faced a massive challenge when the Tsunami hit our coastline in December 2005. The Finance Ministry played a key role in the rehabilitation and reconstruction effort. During this time Amunugama met many of the world leaders who came to Sri Lanka to express their solidarity as well as oversee the rehabilitation efforts funded by their countries. When the cyclone Katrina hit New Orleans and the US administration was floundering, President Bill Clinton who visited this country twice in the aftermath of the Tsunami, publicly recommended that they emulate the effort made by Sri Lanka. The President of the World Bank, James Wolfenson commended the Sri Lankan effort to employ the Banking system to reach everyone of the Tsunami victims. Amunugama’s tenure as Finance Minister saw the highest GDP growth in recent times. In the presidential election of 2007 Mahinda Rajapaksa was elected President and Amunugama was appointed the Minister of Public Administration and Home Affairs. This was followed by a stint as Minister of Investment Promotion and later a return to his old portfolio of PA and HA. In 2009 he turns seventy while functioning in that capacity. This account of our father’s career will not be complete without a reference to his many friends in the world of literature and the arts. From his university days he has befriended many of the leading artists and helped them in numerous ways. Sarathchandra, Siri Gunasinghe, Gunadasa Amarasekera, George Keyt, Amaradeva, Chitrasena, Lester James Pieris, Stanley Kirinde and Tissa Abeysekera were all intimate friends. His collection of Keyts paintings and writings is unique, having obtained them when they were both living in Kandy in the sixties. His collection of paintings includes, in addition to the Keyts, drawings by Deraniyagala and paintings by Kirinde. We have to end this introduction on a sad note. While this book was being compiled our grandfather Walter M. B. Amunugama passed away on June 5th. As noted at the beginning of this essay his influence on our father was immense. He was a role model not only to our father but also to us both. When our parents were away on long periods of duty or study our grandparents filled the void admirably. We therefore dedicate this book to the memory of our grandfather with gratitude and affection. To all those who contributed towards making this publication possible, particularly Senevi mama for his unstinted support in collating information and for his affection through the years, Dini Kurukulasuriya and especially Prasad Rathnasekera for designing and producing this work with tremendous dedication, we say a heartfelt thank you. Our “Appachchi” has been the center of our universe and the inspiration in our lives. We greatly appreciate the love and support he has lavished. We, the family ammi, akki, Ro & nangi together with Harsha, Sunela, Sharya & Sachin celebrate his “Full Life” with many treasured memories.